Sonar systems can be mounted to the hulls of various combat ships, towed behind ships in an array, dipped into the water from helicopters, or attached to free-floating buoys (sonobuoys). Developed after World War I in Britain and the United States, sonar technology was kept secret until World War II, when it was used very effectively to counter the devastating attacks of the German U-Boats. During the Cold War, improvements in sonar technology were critical to tracking the quieter, more sophisticated Soviet submarines. These large submarines were most commonly tracked in deep ocean areas, and the Navy invested a great deal of money and resources in understanding the physics of sound transmission in the open ocean. 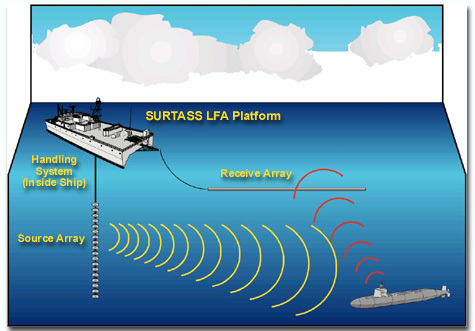 Today, various types of active and passive sonar are used by the Navy to identify, track, and target submarines, to determine water depth (fathometers), and to locate mines. Sonars designed for use in anti-submarine warfare need greater ranges than the others, and therefore have higher source levels. With the end of the Cold War the proliferation of smaller, inexpensive, extremely quiet submarines in the last decade has created a renewed emphasis on the development and use of sonar to counter this serious emerging threat. Geopolitical considerations suggest that future naval engagements are more likely to be fought in coastal waters rather than in the deep ocean. These shallow waters, known as the "littoral," are much more acoustically complex than the deep ocean areas, and present new challenges for the detection and targeting of submarines. Submarines are the ultimate stealth weapon, and in the event of hostilities, they pose a serious threat to both commercial shipping and surface naval vessels. Ship's sonar operators constantly listen with passive sonar for potential submarine sounds, and trained lookout watchstanders scan the horizon for visual indications of submarines. Coupled with intelligence reports of submarine movements, these are the primary tools that ships use to detect submarine threats. 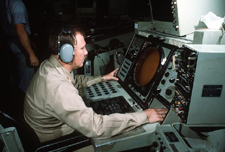 Once sonar technicians have identified a submarine sound, they try to determine the type of submarine from characteristic tonal frequencies, and the bearing of the target. To confirm the submarine's proximity, and to more effectively track its movements, the ship may turn on the active sonar for short periods of time. Unfortunately, active sonar also betrays the host ship's position, so active sonar is used sparingly. In fact, 90% of sonar use by the U.S. Navy is passive sonar. Identifying various underwater sounds (from passive sonar) or returns (from active sonar) is very difficult and requires considerable skill. Marine biological sound sources include whale vocalizations, dolphin clicks and whistles, snapping shrimp, and fish choruses. Other sound comes from underwater seismic activities (earthquakes, volcanoes), lightning strikes, heavy rain, and surface waves. Man-made sounds include commercial shipping and other ship sounds, oil dredges, air guns used in seismic mapping, and sonar. Many sources have higher intensities than sonar, and have a far greater prevalence. Sonar comprises a very small percentage of the sound found in the seas. To put Navy active sonar use in perspective, it is important to note that, of the U.S. Navy's approximately 280 surface ships, only 58% are equipped with mid-frequency active sonar. About half of these ships are underway at any given time, and for each ship, active sonar is turned on only a small percentage of the time (during certain types of training and maintenance activities). Most of the world's commercial shipping passes through a number of strategic "chokepoints" such as the Strait of Hormuz and the Strait of Malacca. A chokepoint is an area where the sea-lanes become narrow due to projections of land, rendering the high-density traffic particularly vulnerable to attack. In wartime, an effective submarine tactic is to rest on the ocean floor with propulsion systems shut down, emitting virtually no detectable sound, and simply waiting silently for the adversary to come to the submarine's location. In coastal waters and chokepoints, where merchant shipping, marine life, oil and gas drilling, and fishing vessels create a cacophony of sounds, active sonar is required to discern submarine-generated sound. Such a submarine in a crucial chokepoint can have a devastating effect on shipping, commerce, and naval presence. In addition to the carnage of direct attack, the effect of delaying arrival of U.S. forces to a crisis area gives the adversary submarine the power to impact the final outcome of a conflict without firing a single shot. During the Cold War, quiet Soviet submarines operating in deep water were often detectable by passive acoustic (listening) technology. Modern submarines operating on batteries and new air propulsion technology are even quieter, and since they operate in the complex shallow water environment, much harder to detect. Passive sonar systems are rendered ineffective in this environment. Water currents, temperature, and salinity variations bend acoustic sonar waves in complex patterns. Rocky features of the ocean floor and debris such as sunken vessels create sonar returns that can be mistaken for a submarine operating near the bottom. Reverberation of sound in rocky areas can camouflage sonar returns. Shipping noise creates additional confusing signatures that must be sifted through. Active sonar is affected by these factors, making real-life training vital to the expertise of Navy sonar technicians. All pinnipeds and cetaceans depend on sound to some degree to sense the ocean environment, and some are known to use echolocation. Echolocation allows these animals to determine the distance of objects (food, predators) and features of the underwater environment (seafloor depth, topography) for navigation purposes. They accomplish this by projecting sounds, called sonar clicks, that are reflected back when the sounds strike an object. The farther away an object is, the longer it takes for the echo to return, allowing the echlocating animal to tell the distance. Echolocation makes it possible to navigate and feed at night and in deep or murky water, or at great distances where visual sensing would be ineffective. For example, a dolphin can detect a target the size of a golf ball almost a football field away, much farther than the dolphin can see underwater. Marine mammals also use underwater vocalizations to communicate with each other. Because sound waves travel efficiently in water, some ocean-dwelling animals are able to communicate over great distances through sound. Based on the few marine mammal species for which hearing has been tested to date, it appears that a given species' hearing is tuned to a broad range of frequencies with the greatest sensitivity typically encompassing the range of vocalizations and echolocation (for echolocating species). There are 119 species of marine mammals, ranging from one to 40 meters in length and from 45 to 95,000 kg in mass. These species have widely varying sensitivities to sound based on frequency. This is a reflection of how different species have evolved to cope with life in the marine environment, including differences in size, prey, habitats, and the predators they try to avoid. Species that live in the same habitat may have overlapping, but not necessarily identical, hearing ranges. For example, smaller odontocetes have a hearing range of up to 150 kHz, while mysticetes (including gray whales) have an estimated hearing range from 20 Hz to at least 3 kHz. High-powered sonar transmitters may harm marine animals, although the precise mechanisms for this are not well understood. Some marine animals, such as whales and dolphins, use echolocation systems similar to active sonar to locate predators and prey. It is conjectured that sonar transmitters could confuse these animals and cause them to lose their way, perhaps preventing them from feeding and mating. It has been suggested that military sonar may induce whales to panic and surface too rapidly leading to a form of decompression sickness.